I’m very happy to have opportunity to present at Sinergija 16 that takes place in Belgrade from 17th to 19th October. Also, it’s special honor that I have 2 sessions this year. Both sessions are on 2nd day(18th October), first at 13:40-14:40 in Adriatic 2 room and second at 16:20-17:20 at Baltic room. First session will be on Azure Stack where I will talk about Azure Stack in general (for those who didn’t hear about it before), then I’ll move to new features in TP2 and finish with some deployment hints. 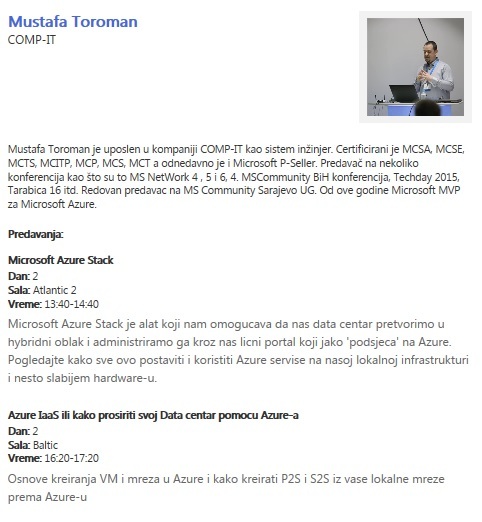 Second session will be on Azure IaaS or how to extend your datacenter to the Cloud where I will be talking about Azure Services that help you achieve more with your local infrastructure, with focus on Azure Networking and connection your local network to Azure VNet via Site2Site connection.